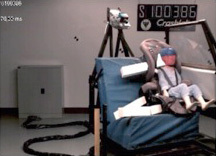 In all tests, crash test dummies that are equal to or above the upper end of the mass limit for each type of child car seat are used to measure the forces experienced by the dummy during the test. The data gathered is then analysed and the car seats are scored based on several performance aspects. The frontal impact test simulates a situation where a correctly restrained child is involved in a head-on crash with another car of similar mass travelling at the same speed. In this test, the child car seat with the restrained dummy is tested at a speed of 56 km/h and deceleration of 34 times the earth's gravity. The car seat is evaluated in term of its ability to retain the dummy's head and torso, minimise the forward and upward motions of the dummy's head, manage the crash energy, maintain its structural integrity, and ensure the harness buckle is still working properly after the test. 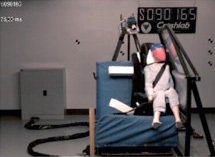 The side impact test simulates a situation where a correctly restrained child in a car is struck from the side (90 degrees) by another car of similar mass. In this test, the child car seat with the restrained dummy is tested at a speed of 32 km/h and deceleration of 20 times the earth’s gravity. The car seat is evaluated in term of its ability to retain the dummy’s head and torso and maintain its structural integrity. 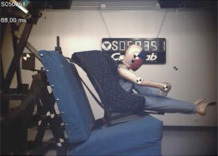 The oblique impact test simulates a situation where a correctly restrained child in a car is struck at an angle (66 degrees) by another car of similar mass. CREP also assesses how easy it is to use child car seats correctly. The assessment methods were originally taken from methods developed by the US National Highway Traffic Safety Administration (NHTSA). However, the Australian protocol expands on those used in the NHTSA method and includes additional assessments of features. These primarily relate to the product packaging and an assessment of any feature modified from the base model. Securing/releasing the car seat within the vehicle (not used for booster ratings). Each feature is scored on a scale of excellent, good, above average, average and meets AS/NZ Standard. Each car seat is evaluated by a single expert assessor. A second expert then independently performs an audit on a small sample of the seats. A panel then compares the results and where appropriate, reviews the assessment criteria and ratings for all seats. This 9 month-old baby is sitting on a parent’s lap. The parent is wearing a seatbelt, but the child is unrestrained. The airbag inflates into the baby’s face, lifting the baby towards the vehicle roof. The likely damage to this baby would be a broken neck and possible skull fracture. The parent would possibly suffer a facial injury. This child has placed the sash belt under his arm. In this 48 km/h crash, the sash belt slides down with both parts of the belt, then tightening into the child’s abdomen. The child’s body wraps itself around the belt. Internal abdominal injuries, possible spinal, neck and facial injuries would occur.